The Scorpion HKII-4225-610* Limited Edition motor for use on 600 class helicopters running on 12-cell Li-Po power. 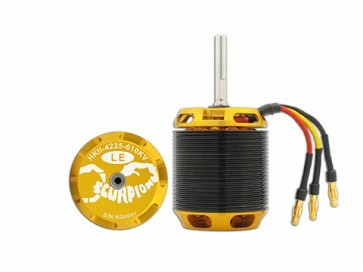 This motor represents the most technologically advanced power source ever offered for a 600 class electric helicopter. Each of the new HKII-4225 Limited Edition motor is wound with a single strand of 1.4mm wire for the highest possible efficiency. This motor is capable of running continuously at an input power of 3550 watts at 80 amps, and can handle peak inputs of 5770 watts and 130 amps.